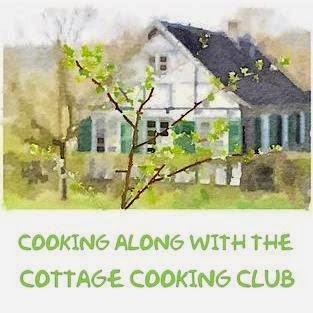 Today's post is the second installment of the Cottage Cooking Club , a virtual cooking group started by Andrea of The Kitchen Lioness. We are currently cooking our way through the River Cottage Veg cookbook by Hugh Fearnley-Whittingstall. Every month 10 recipes are chosen and we pick and choose which one or ones we want to blog about in a single post. For the month of June I chose two recipes. The first recipe was Pizza with new potatoes, rosemary, and blue cheese. I started out making the "Magic bread dough", which is aptly named as it can be turned into many different things, pizza, flat bread, pita bread and even bread sticks. The dough was easy to make and I had enough for three pizzas total, so I froze the other two for later. After caramelizing the onions and rolling out the dough, I added the onions, cooked potatoes and thin slices of blue cheese. Baked for 10 to 12 minutes. This was delicious, I would not change a thing. Now for my second and last recipe, the Lettuce, green onion and cheese tart. This one required making a pastry dough for the shell. It was easy to put together and very tasty in the end. The lettuce and green onions are first sauteed, each one separately. This step adds in such a great flavor. I will start using more cooked lettuce in other types of dishes as well after this. Everything is then added together and then baked for 35 minutes. I served this at room temperature with a simple green salad and it was delicious. I followed both recipes very closely, but you could easily change out any of the vegetable combinations to make it your own. The instructions were easy to follow and all the ingredients were fresh and obtainable. I can see myself making these again and again. Recipes adapted from River Cottage Veg, by Hugh Fearnley-Whittingstall, first recipe cookbook chapter Bready Things, Pizza with new potatoes, rosemary and blue cheese page 182. Second recipe cookbook chapter Comfort food and feasts, Lettuce, green onion and cheese tart, page 44. Both the pizza and tart look extremely mouthwatering! I love this book. You are one busy beaver, Cheri! Those are great dishes and that pizza is truly unique. Thanks for sharing them! Hi Robyn, yes I have been crazy busy. This looks lovely! The pics are very cool. I love step-by-step photos. They both look very delicious, Cheri. I love particularly that tart. Hi Angie, the tart was delicious with the sauteed green onions and lettuce. Hi Amy, oh you will love this book, it is such a great one. The pizza was great! What a wonderful thing to do with other women. The pizza looks delish! Hi Dena, yes I think so too, it's been a lot of fun so far. Great looking pizza...have fun with your cooking club! Cheri! What fun fun fun! I love that you're part of a cooking club and I love that this marvelous pizza turned out fantastic! Thanks Devaki, it has been fun. It is funny, but the pizza restaurant not far from here makes that same pizza, but only in the winter. they say it is their winter special. What ever is is, it looks pretty good! Hi Abbe, sounds like a great pizza place. Loved this combination. I love this new series on your blog Cheri, this looks fantastic and delicious, need to try it for sure!! Great pies! I don't know which one I like more...just can't decide! Thanks Ela, they were both good. Both the pie and the pizza look amazing Cheri, great job! Thank you it was good. The recipes both sound great! WOW, and then double wow. I love that you are with a group going through a cookbook and creating the recipes for all of us. Hi Marlene, it really is a lot of fun. What a nice group! the recipes sound wonderful. The River Cottage cookbook is wonderful, isn't it? That pizza in particular sounds absolutely delicious, and I love the idea of having plenty of pizza dough left over. And ... lettuce in a tart? Genius idea! Hi Helen, yes, it is a great cookbook, one of my favorites. Both recipes sound different and delicious. Thanks Karen, they both were delicious! Cheri, these look terrific. I had planned to make the Pizza but alas my new and fabulous cookbook only arrived yesterday afternoon! Whew. Last night I quickly prepared the frittata with summer veg and goat's cheese- wonderful! Love the lettuce and green onion tart you made, it looks, and sounds from your description, quite delicious! Thanks for sharing! Hi Peggy, the frittata sounds delicious, I am really enjoying this book, it's one of my new favorites. I really need to get that cookbook one of these days. Everything from it looks so good! Thanks for this. Hi John, this one is a really good one, thanks! I just made the peppers stuffed with potatoes and pesto out of that book! It was a great one. Now I must try both of these!! Hi Joanne, I was eyeing that one as well, love all the color of the peppers and pesto in that one. Yes it does, everyone so far has been a big winner! Cheri, my mouth is watering just looking at these!! Thanks Sherry, appreciate you stopping by. oh my! these look so good. I love the potato rosemary and blue cheese combo. i have recently started using lettuce in dishes other than salad lately too. Cos lettuce is really good in stir-fries for instance. Hi Sherry, I just figured that out myself, what a great way to use up lettuce from the garden. 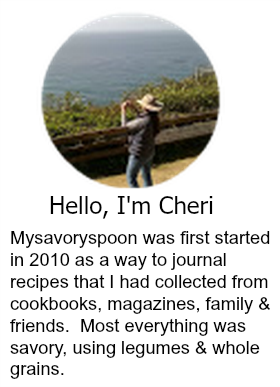 Cheri, I am so glad that you are enjoying the lovely cookbook and our group so much! The Pizza is indeed quite the treat, I made it myself (post will be up later today) and the tart is next on my list - you did a wonderful job with both these lovely recipes! And I am so happy that you joinded us! Thank you for this wonderful post! Thanks Andrea, enjoying the great company! Now you have me interested in making this dough. I didn't realize it could used for so many things. Hi Diane, I love things like this that are multi purpose as well! I loved reading your post. Very interesting about your (delicious-looking) lettuce and spring onion tart. I did not make that this month, but it sounds amazing. I did make the pizza and enjoyed it. The dough is fun, and I love that you can take if from the freezer and use it for different things. Thanks! I so far all the recipes I've prepared are ones that I would prepare again, really enjoying this book. Hi David, the dough seems to freeze very well, have extra in my freezer right now. Both of your dishes look wonderful. I made the pizza also and thought it was delicious, especially the crust. But the pie has me intrigued......I rarely cook lettuces, and baking them would never have occurred to me! Hi Zosia, love that you added whole wheat flour to your pizza dough, I bet it was delicious! I just discovered cooked lettuces and it is such a wonderful thing, we are really enjoying them. What a great pair of recipes, I love that the dough is so versatile! Thanks Chris, these really were great recipes using fresh summer veggies. I really need to pick up this cookbook. I've loved the sound of everything you've made from it so far! Thanks for sharing! Hi Susan, this cookbooks is one of my favorites, love it! Thanks for popping by my blog and leaving a comment! Both of your recipes sound wonderful. HI Penny, thanks for stopping by here as well. You are so brave to have tested the recipe for the tart with the cooked lettuce! I was eying it for a bit and then I shied away. The pizza was delish! Oh the lettuce was delicious, I plan on cooking it more often. Thanks for stopping by. They both look amazing but I think the pizza just might be my favourite. This book has been on my to buy list ever since Andrea started cooking from it. So many delicious recipes with vegetables. I agree, this is a good one. Happy Sunday to you! Well done. I didn't get the blue cheese pizza made - just ran out of time in June - but still have it on my make-up List. I am a blue cheese addict. I was expecially interested in your Lettuce, Green Onion and Cheese Tart. Cooking lettuce. Hmmmm. Since you liked the result, I will give that a go also. Although the summer has been busy, I am glad I am cooking through Hugh's book. I like it and I think you do, as well.